I remember all the fuss about this album and the accompanying movie, which was annoyingly pretentious. All of a sudden U2 were the "greatest band on the planet" and Bono could do no wrong. 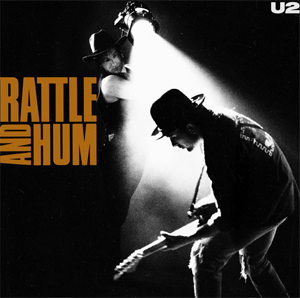 I had a girlfriend at the time who blathered on thus - "did you see Bono in "Rattle And Hum"? He went into a gospel church and sang with the choir, wow he was fantastic, they are the best band the world have ever seen". Yes, she really said that. Personally, the movie left me cold and the whole hype about it I found perplexing, to be honest. The gospel bit was uplifting, though. This, the soundtrack album, is a strange affair - a mixture of collaborations, contrived tracks and a few live ones - it meanders all over the place. It supposedly highlights U2's undying love for Americana and the blues, something I (and most other people) had not noticed in their music up to this point. I have to admit I always found it puzzling when Bono exclaims in "Silver and Gold" - "ok, Edge - play the blues", and The Edge delivers a typically U2 guitar part that is certainly not the blues, wonderful although it is. Bono is also on somewhat embarrassing on-stage pronouncement form. Nobody at the time seemed to feel that way though and they lapped up "Charles Manson stole this song from The Beatles - we're stealing it back" and "for The Reverend Martin Luther King - sing!". I know the guy's heart is in the right place, but it just doesn't always work for me. I'm probably being far too harsh. After all, I agree with what Bono has to say. Anyway, as to the album, which has received some brickbats over the years. It has some good moments on it, however. It is certainly not as bad as people say. It just has an air of self-satisfaction about it. "Van Diemens' Land" I have always liked, although it ends to soon, ridiculously faded out before it properly ends - why I don't know. "Desire" is great however, with a thumping "Not Fade Away"/Bo Diddley rolling drum rhythm. "Hawkmoon 269" is an insistent, slow building anthemic number that I have always liked, particularly the gospelly backing vocals at the song's denouement. You know, I have always thought their solidly rocking live cover of Bob Dylan's "All Along The Watchtower" was great too. "Angel Of Harlem" is a superb, exhilarating horn-drenched Stax/Motown/Aretha Franklin tribute. It is very un-U2 but its great. It just a bit incongruous in their hands. They are not Bruce Springsteen. I never thought they had a love for Stax or Atlantic soul. The other live tracks are actually pretty convincing - "Helter Skelter" is rousing and gets the blood pumping; despite the criticism from many, I love the gospel version of "I Still Haven't Found What I'm Looking For"; "Bullet The Blue Sky" is searing and bristles with righteous indignation while "Silver And Gold" is a good, rumbling, bassily evocative rock song, just not the blues. "Pride (In The Name Of Love)" is the stadium celebration it always should be. You can't really criticise them for these cuts, let's be fair. Another great track is the proper rocking blues of their B.B.King collaboration, "When Love Comes To Town", featuring some truly superb blues guitar from King. The song they wrote with Bob Dylan is slowly appealing but goes on a bit too long. "Heartland" is a low-key, slightly mysterious track that sounds as if it dates from "The Joshua Tree" period, and "God Part II" is a sort of updated re-write of John Lennon's "God". It has a huge, pounding drum sound and is one of their rockiest-ever tracks, despite its somewhat unoriginal derivation. 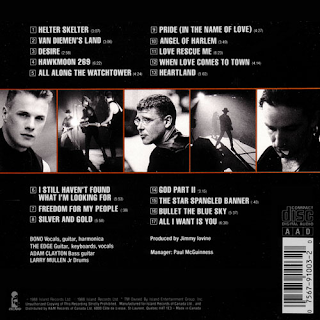 "All I Want Is You" is a bit drawn-out but it has some typical U2 guitar there, which was quite rare on this album. You know, listening to this, as I said earlier, it is nowhere near as bad as it has been retrospectively made out to be. It just isn't "The Joshua Tree" or "Achtung Baby".